Pisces March 2015 Horoscope predictions foretell that you should be aggressive and independent in the pursuit of your targets. You have the power of the divine forces behind you which will help your overcome all obstacles. In March 2015, the Pisceans might be bothered by family and domestic issues combined with emotional stability taking precedence over career. Your outlook towards life undergoes a major change during this period and you have a strong urge to be free from all your attachments. The March 2015 Pisces monthly astrology predictions indicate that your diligence will be recognized and you will be financially rewarded generously. You may change your job for better prospects and you will have your way at the work place. Business will be prosperous with excellent returns. Get free horoscopes for April 2015. The Pisces March 2015 financial horoscope predicts a favorable period after the 21st. Money will come from all sources through career as well as family and friends. 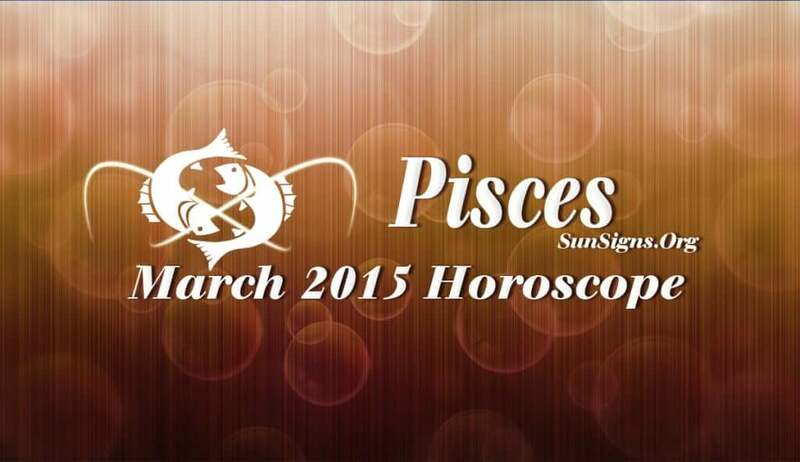 The Pisces love horoscope for March 2015 suggests that relationships will be blissful. This month love will come chasing you. Singles have plenty of opportunities to form romantic alliances by dating different people . Change of residence or buying a new place is probable. The month is ideal for renovating your house. This is also a good month to plan for a pregnancy as Venus and Mercury are in your favor. March 2015 will see your health making good progress and your physical fitness goes up drastically. You have to be mentally stable and should not be affected by financial tensions in life. You can try a few of these home remedies for anxiety if you find life to be too stressful.